Practice really does make perfect but when it comes to practicing the drums this can become an issue, as drums are very loud. Unless you live in the middle of nowhere, have neighbors that are deaf or use a soundproofed room, you are going to run into issues by continually practicing. There is the solution, drum practice pads. Tip: Below we will give you an insight into factors to take into account when considering purchasing a practice pad, but if you want to skip this, and go straight to the pads we are reviewing they are listed below. Just click on the links. Practice pads are a nifty solution to assist you in honing your drumming skills to perfection along with warming up before a gig or practicing new techniques, as they do not make too much noise and allow drummers to target certain aspects. Whether you are a beginner to drumming or a seasoned pro, a practice pad is a tool that all drummers should have. There are numerous pads available so choosing one is not easy; luckily, we have reviewed six of the best drum practice pads you can buy. Before we get to the reviews, let us look at some of the things you might want to consider when choosing a practice drum pad. How portable is the Practice Pad? Portability is among the main concerns when purchasing a pad. They are excellent for practicing on behind the scenes at a gig and for warming up. Therefore, you should take into consideration the size and weight of the pad. Of course, if you are using the pad at home this is not so much of a concern. Practice pads are different sizes with some being around 14 inches in size, which is approximately the same as the standard snare drum. Others are extremely small, only 4 inches in size. Tip: Does size really matter? It does when it comes to choosing the size of a drum practice pad! The larger the surface of the practice pad the easier it is to practice on, while the less portable it might be. Weight also needs some consideration, as while the heavier pads are less portable, they are sturdier, while the lighter pads may be more portable they may move around when practicing on them. How versatile is the practice pad you are considering? When choosing a pad you might want to consider the music genre. Do you play several styles, for instance, jazz, rock, or pop? If you do, you need a pad that offers sound versatility. Perhaps you might be better choosing a pad with two sides, with one being bouncier and quieter than the other and the other harder. The material of the pad is going to determine the feel of the pad. Some of the practice pads mimic a real drums feel while others focus on the creation of levels of resistance solely for practicing. 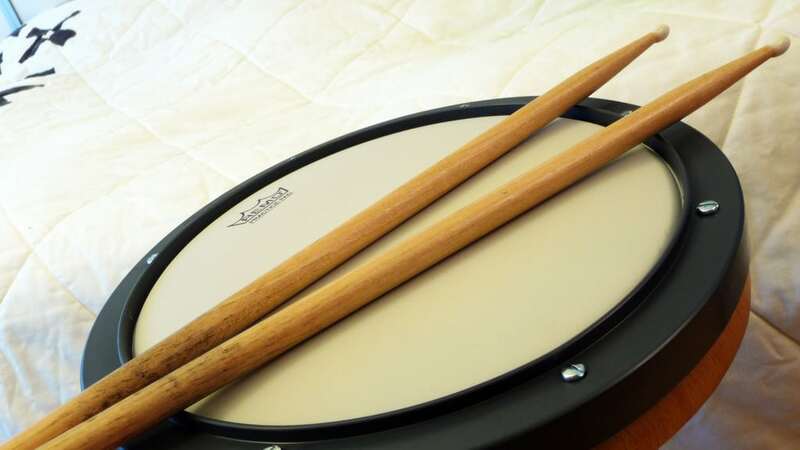 Rubber, plastic, and wood are common materials used for practice pads. Tip: The Evans RealFeel might be right up your street if you want to mimic the real drum feel. The material is also going to determine the volume of the pad and the quality of the sound it creates. Quieter sounds come from a softer pad. This is a great choice if loud sounds are going to be an issue. Some pads may be more suitable than others depending on your skill level. For instance, if you do not drum professionally and are a beginner, virtually any pad will be adequate, providing the volume and feel is right. Professionals may want to consider pads with multiple surfaces, pads that have thicker materials or those which have snares to give a snare drum sound when practicing. The price tag may also be a factor to consider with beginners going for the lower entry-level and professionals the higher price range. Now on to the six top drum practice pads we are reviewing, in no particular order. The Movement Drum Co, 12-inch Double Sided Practice Pad is a great round shaped pad for warm up, practicing or honing skills on. This is sold as being the most complete practice pad on the market, but does it live up to its name? Let us look at some of the top features of the Movement Drum Co. 12-inch Double Sided Practice Pad. Should You Buy the This Drum Practice Pad? The Movement Drum Co. 12-inch Double Sided Practice Pad is a very versatile pad thanks to the top surface, which is made from durable silicone rubber. Anyone wanting a low-rebound can insert the conditioning surface that comes with the practice pad to obtain a quiet surface offering technical performance. The conditioning surface offers shock absorption while also having rebound. The other side of this practice drum pad offers a surface that is quieter with less rebound and suitable for anyone wanting peace and quiet while practicing or who want to increase the development of muscles. The Movement Drum Co. 12-inch Double Sided Practice Pad is more suited to the intermediate to professional player. Now let us proceed to the good and bad points of this drum practice pad. What do we think about the Movement Drum Co. 12-inch Double Sided Practice Pad? The Movement Drum Co. 12-inch Double Sided Practice Pad is a very versatile choice and is well worth considering whether you are an intermediate or professional drummer. It is a terrific choice to practice technique or warm up or when you when want to quietly practice drumming. While it may not be the cheapest option on the market, it does offer superb value for money thanks to it offering multiple playing surfaces, which mimic different playing surfaces. The Vic Firth 12” Double Sided Practice Pad PAD12D is hexagonal and constructed with a wooden base that is dense which offers an authentic drumming experience. It is double-sided and comes with soft rubber for practicing quietly along with a harder surface for a more intense practice session. So what stands out about the Vic Firth PAD12D? Is this Drum Practice Pad Worth Buying? The Vic Firth practice drum pad is worthwhile considering thanks to it offering two sides making it versatile. It has a price tag that is not going to break the bank for those entering into drumming who wants a practice pad. The wooden base provides an authentic feel, but it is more along the lines of being a standard practice pad. Professionals might want to focus on other options. The Vic Firth practice pad is aimed at the beginner or intermediate drummer who wants a standard practice pad. Now we go on to the pros and cons of the Vic Firth PAD12D practice pad. The Vic Firth PAD12D 12” Double Sided Practice Pad is an affordable option, but some owners have complained about the construction of the practice pad. This is a good choice for those who want to practice stick techniques and it is one of the more portable choices due to its lightweight. It does offer an authentic drum feel thanks to the wood base. Be aware of the fact that while the rubber is high quality it does have a smell that is strong and this lasts for a while. The Evans RealFeel RF12D Practice Pad is a hexagonally shaped drum practice pad offers a large playing surface and is as close to playing a real snare drum as you can get with a practice pad. There are options in size of the pad, 6”, 7” and 12” but in this instance, we are comparing the 12-inch version. The drum is two sided with one side being quiet and having a natural gum rubber that has a slight texture giving realistic stick rebound. What are the features that stand out on the Evans RealFeel 2-Sided Practice Pad? Anyone wanting a drum practice pad to use anytime and anywhere might want to check out the Evans RealFeel RF12D 2-Sided Practice Pad. It is ideal for all skill levels whether using it before a gig, to practice skills or strengthen muscles. The drum pad built well with two sides making it versatile for whatever practice type you require. The Evans RealFeel is also the closest thing you can get to a real drum kit in a practice pad. The Evans RealFeel RF12D is suitable for all skill levels. Now we are going to look at the good and bad points of the Evans RealFeel RF12D. The Evans RealFeel RF12D 2-Sided Practice Pad is a versatile drum pad thanks to its two different sides. It offers a generous playing surface and fits into a snare drum basket if required. It has a great look with the gray finish, the quieter side and black side that is louder offering less bounce. The natural gum rubber is tear resistant which means it should last for many years. The practice pad is a wonderful substitute for an acoustic drum from a brand name that has been in the business for more than 40 years and is well worth considering. Tip: Check out our tips for getting the most out of practice pads at the bottom of the page. The Drumeo P4 Practice Pad has a distinct style and looks that stands out, divided into four different playing surfaces on the one side, with three distinct levels. This is a colorful round practice pad of 12 inches and offers a snare-like practice, a ride cymbal, floor tom, and high tom, all in one. It may just be the most practical of the practice drum pads that we have reviewed. What Stands Out About the Drumeo P4 Practice Pad? Is this Drum Practice Pad Worth Purchasing? The Drumeo P4 Practice Pad is well worth purchasing thanks to the huge amount of versatility it offers. This practice drum pad is the closest thing you are going to get to a real four-piece drum kit in regards to sound and feel and for a reasonable price tag. The drum practice pad is stepped over three levels with the red at the top, the thickest part of the pad, the black and cream in the middle and stepped down to the blue, the thinnest part of the pad. The Drumeo P4 practice pad can be utilized by all skills. However, professionals may be able to get the most from it. Here we look at the pluses and minuses of the Drumeo P4 pads. The Drumeo P4 practice pad is a superb choice of drum pad for those who wish to practice a variety of different drumming styles. The different sections are laid out clearly, both in color and in steps, with the neoprene surface representing a high-tom. The rubber side represents a floor tom and the harder surface the ride cymbal. While the practice pad is suitable for use by all skills level, the professional will more likely appreciate and make the most of the different sections on the pad. The pad is worth some consideration to move up to from one of the cheaper and more basic practice drum pads on the market. The Remo RT-008-00 is the smallest practice drum pad that we have reviewed here at 8 inches in diameter and round. It offers an Ambassador Coated drumhead that is replaceable and which gives bounce and feel of a real drum kit. This tunable practice pad is able to recreate a snare drum and thanks to the size, it is extremely lightweight and portable. The Remo RT-008-00 does stand out for being tunable so tension can be altered by way of the screens around the rim of the practice pad. The pad offers a bounce that is very much like that of a real drum but keep in mind that it is only 8 inches in diameter so size could be an issue. However, on the plus side, its size does mean it is lightweight, which makes it extremely portable. The drum pad does replicate the sound volume of a snare drum but some owners have said it could be improved upon and it is a basic drum pad. The Remo RT-008-00 is aimed at beginners to drumming wanting a first low-priced practice drum pad. Now on to the pros and cons of the Remo RT-008-00. While it does replicate a snare drum the sound is not as good as others we have reviewed. Anyone looking to purchase a basic drum practice pad might want to consider the Remo RT-008-00, as it is the most affordable solution we have compared here. On saying this, you might want to bear in mind that you generally get what you pay for and there is not much by way of versatility with this drum pad. It is tunable but it does not offer multiple playing surfaces or sides, it just has the one side. The size may also put off some people, as it is the smallest one we have looked at in these reviews. On the plus side, it is the lightest practice pad in our reviews. The Movement Co. 12-inch Double Sided Practice Pad 3-in-one Laminate is fully rimmed. It offers three distinct surfaces putting it among the most complete practice pads on the market. The practice drum offers a realistic top surface made from silicone rubber with a laminated insert. The practice pad can be used without the insert, which gives it a response and feel of a snare drum. However, how does it compare to the others we have compared? What Stands Out About the Movement Co. 12-inch Double Sided Practice Pad 3-in-one? Here are some of the features of the Movement Co. 12-inch Double Sided Practice Pad 3-in-one Laminate. The Movement Co. 12-inch Double Sided Practice Pad is towards the high-end price tag of those we have reviewed here but owners have praised it for being great value for money. At 12 inches, it does offer a good-sized playing surface and it does have three different playing surfaces. For those wanting a response that is more articulate the laminated insert can be used, while the bottom side, made from rubber, provides a softer and quieter hitting surface with less rebound. We will now move on to the tech specs of the Movement Co. 12-inch Double Sided Practice Pad. Who Is This Practice Pad Suited To? The Movement Co. 12-inch Double Sided Practice Pad is suitable for all skills levels. Now we look into the good and bad points of the Movement Co. 12-inch Double Sided Practice Pad. The Movement Co. 12-inch Double Sided Practice Pad 3-in-one is a great option with its three playing surfaces and two sides. It offers realistic sound and feel and is extremely portable thanks to it being thin and lightweight. Anyone looking for a fully rimmed practice pad might consider this one as it is an all-purpose pad. The laminated surface offers an articulate drumming experience when inserted, when removed the bottom is rubber and quiet with less rebound while the top is louder, made from durable silicone rubber and feels like a snare drum. Practicing is essential for developing good stick control. At least half of the time spent practicing should be undertaken using your pad. You can use it to work on building up endurance and muscles by playing rudiments (basic drum patterns). The rudiments constitute one of the essentials for all percussionists as they are the foundations of drummers and there are about 40 of them, with some being variations on others. When using the pad for practicing not only is it quieter but it is also less distracting for you mentally than practicing on a drum set where you may go off and do your own thing and forget about the rudiments. The practice pad is great for helping you to increase control and speed when drumming. 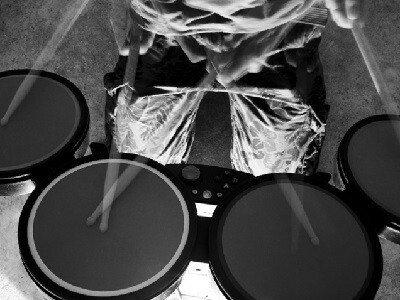 If you purchase a drum pad that offers different surfaces, you can practice with larger sticks. Many pads offer different surfaces with variations in the rebound and bounce and this leads to building up the muscles of the wrist and fingers faster. Bigger sticks help, for instance instead of using 5a sticks practice using 2bs. Practice for some time and then revert to your normal size sticks and you will notice results. 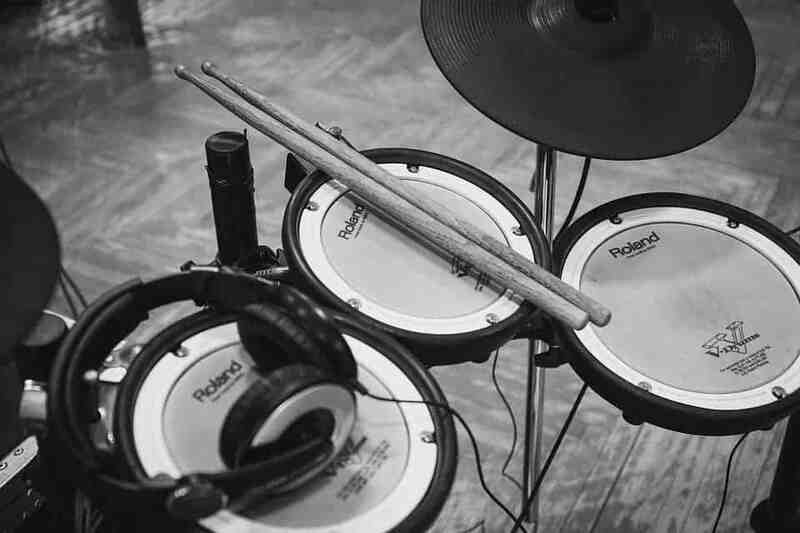 A drum pad is a perfect tool to practice unique music styles. You can try out songs and beats that are usually beyond your skill level by jamming along, doing so enables you to become more creative and step outside of your comfort zone. However, bear in mind that practicing technique and jamming are two separate things, albeit both important and enjoyable. While practice really does make perfect there is no point in forcing yourself to practice. If you are tired, leave the practicing, go and do something more restful. Forcing yourself to practice never works out; you have to enjoy it to better yourself. If you enjoy practicing, you are going to get more out of the session than if you force yourself and you are not enjoying it. By now, you should have gained a better insight into the diverse brands, types, and styles of practice pads on the market and have a better idea about which one is more suited to your needs. 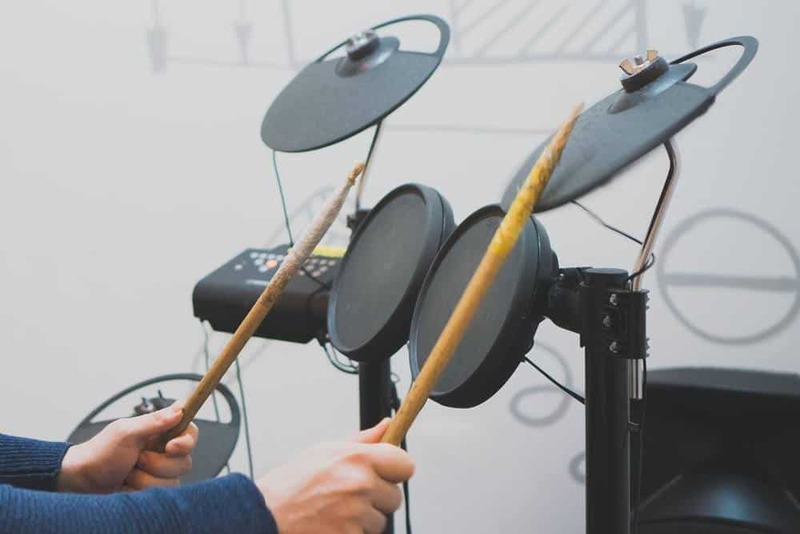 Whether you are a beginner to drumming who wants to learn everything there is to know about styles of drumming or a seasoned professional who wants to keep on top of their game, our reviews of the best drum practice pads will go a long way towards helping you.